Another exciting application of MoBcache is in metros, bus or train. As the content can be stored or pre-fetched in the MoBcaches located in the train or bus, communication can be improved even when the user has no Internet connection between 2 stations. Thanks to automatic content storage in the MoBcache, the bandwidth utilized by the user is minimized. This is especially important in streaming sessions, where the bandwidth consumption can be divided by an integer factor. Additionally it can increase significantly revenues for community operators. 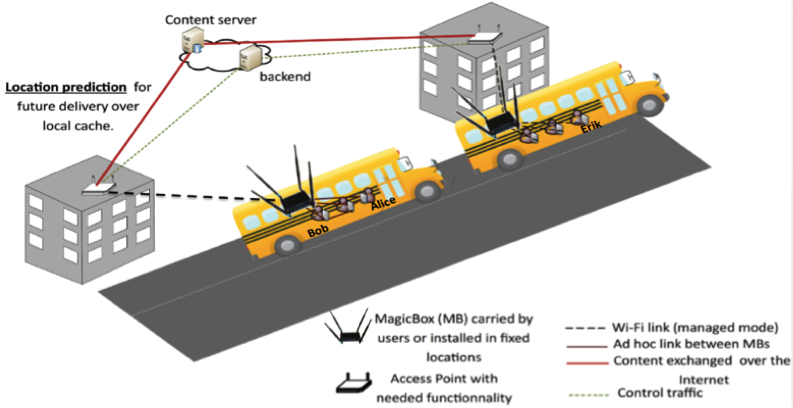 CDN infrastructure deployed by the content provider can be minimized, as magic-box are setting up an ad-hoc “mobile CDN”. This leads both to significant cost reduction for the content provider, and better QoE delivered to the user.